Product Description: Tenergy Exclusive Syma X5SC is a headless, ready- to- fly quadcopter with 2MP HD camera an ith image quality of 720p. The drone is attractive in thunder blue color and has the facility to interchange the blades and guards in different colors (black, blue or white). Similarly, as additional accessories, you get landing gears and protective guards in three colors respectively. You also get a 4GB micro SD card. Along with these additional accessories, you get the regular stuff like USB charger, 2.4 GHz remote control, 2 Lithium Polymer batteries, USB card reader, 1 screwdriver and user manual. The charging time for the battery is around 130 minutes and fly time of the drone is 5-6 minutes. The best navigation range of the controller is 30 meters. Features: As with all other headless drones, Syma X5SC too does not pose any issue of orientation while flying and you can easily maneuver in any direction. This is IOC or Intelligent Orientation Control system, where the forward direction is not necessarily the nose direction. The 2MP installed HD camera has the support of 4 GB micro SD card to store the recordings. This ensures that you can record and store videos from different flights and enjoy them later in your own free time. The matching curved fanned blade guard protects the props from damage in case of crash or collision with obstacles. The 6-axis gyro system is best for easy maneuvering as it has the ability to stabilize the drone during various flight modes. The 3D lock makes the flips easy and manageable to take videos / pictures during flight. Advantages: If you are first time flier, then this headless drone is the right type for you to start with. Since there is no issue of orientation dependency while controlling a flight, you can slowly learn how to pilot the quadcopter and understand the various modes. Store and playback your video recordings as and when you want them. The 4 GB SD card keeps the recoding data from your various flights for further use, so make the most of your aerial view recordings. 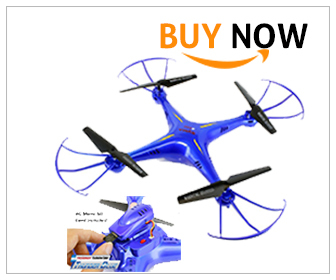 This Thunder Blue quadcopter comes with additional accessories like 3 sets of propeller guards, 3 sets of landing gears and 2 sets of rotors, to replace in case of emergency. Each accessory is available in Blue, Black and White variants so that you can mix and match them if you like. It is a good thing that this drone comes with an extra LiPo battery. This gives you extended flying time by immediately replacing the used battery with a fresh, charged one. You need not wait for two hours for the copter battery to recharge. Disadvantages: On quite a few occasions, the drone fails to respond to the controller after setting for the first time. You need to calibrate it properly to see the quadcopter airborne. Beware of where you fly and how far you take it. This drone has a tendency to drift away since there is no “Home” button on the controller. Verdict: For the price tag of around $100, this drone can be ideal to practice your maneuvering skills. It just performs basic flying with some flips. Do not expect too high end stuff.